Fighting our disposable culture doesn’t just require green solutions, more efficient packaging and better supply chain management. * It requires shifting our attitudes and dismantling the sense of entitlement surrounding disposable culture. Not only do I want to be able to use as many damn napkins and plastic utensils as I want, I don’t want to hear you dirty treehuggers complaining about it. Actually, that’s the general I; the specific I would love it if we all used cloth napkins and brought our own utensils everywhere we went. During lunch a few years ago, I noticed that my friend Dharmishta was eating with a foldable camping spork, which she regularly carries around with her. I started doing the same, though with a standard metal fork — which is less convenient and, occasionally, more stabby to have in my backpack. 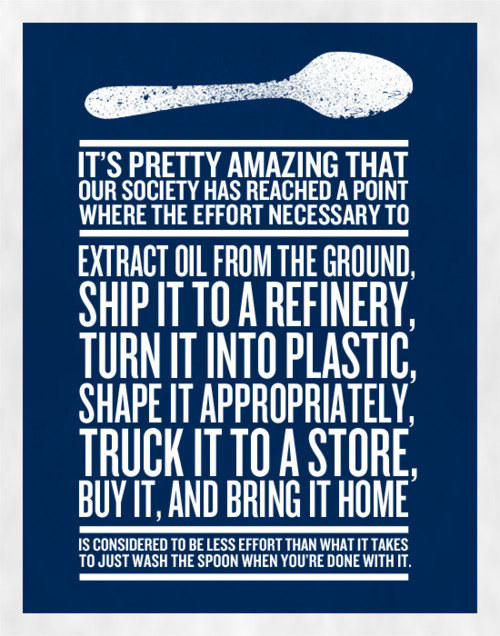 (But I can tell myself that I’m saving the energy costs saddled with producing a camping spork, right?) My mom carries around her own chopsticks, in part to avoid using disposable ones, in part because she worries that the non-disposable chopsticks in Taiwanese restaurants aren’t actually clean. The request: Don’t be grossed out when I wipe or lick my fork clean and stick it back into my bag. I wash it when I get home. The question: What disposable habits of your own would you dispose of have you broken/will you break? ** I literally lost my train of thought here fantasizing about the pumpkin curry. The first time I ate there, I underestimated their spice scale and was crying into my food by the end of the meal because it was both too spicy for my sinuses and too delicious for me to stop. Also, since this blog is about digital identity, I should note that when Facebook added that little box where you could describe yourself, I entered “Pumpkin curry with brown rice.” That’s all the self-description I need. *** This dilemma is further complicated by the fact that it’s pretty much culturally illegal for Chinese people to waste food. According to GOOD, by the way, 27 percent of the food we bring into our homes ends up in the trash. Incidentally, they also have a challenge up to create tasty meals out of leftovers; deadline is tomorrow. I carry around a pointy metal fork as well. I sometimes forget to wash it. I punctured myself once while reaching for a pen. Worth it! Thanks for re-sharing on Facebook, Janel! It’s cool to hear all of the ways you’re reusing plastic; you should make your own poster. There are some cool mesh produce bags that you can reuse — I have yet to invest, but I feel like it’ll happen sooner or later.